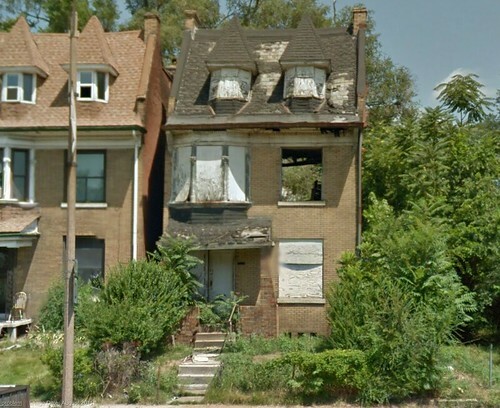 Earlier this year I was panning around the central corridor on Google Maps and stumbled across this horrific site on Page Boulevard just west of Kingshighway. Two homes had been demolished, but the pattern of debris almost gave the appearance that the homes had exploded. 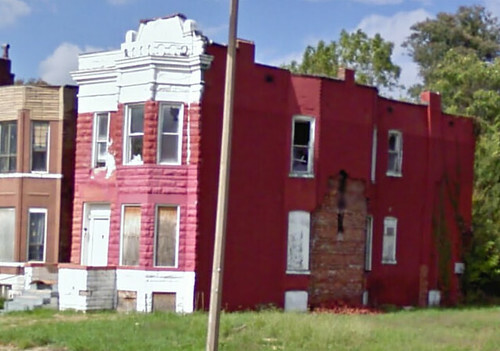 I took a look at the Streetview and was stunned when I saw the facade of the west demolition. 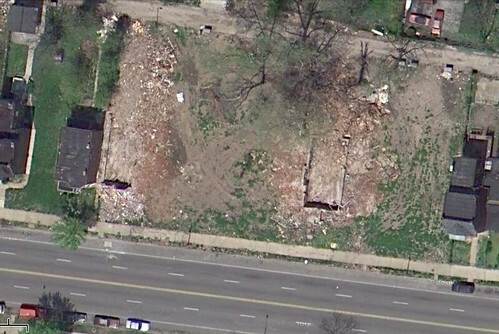 Checking Geo St. Louis, I found some better images. Although the house has lost it's porch roof and part of the facing to the right of the window above, lost the top of it's parapet and has been painted, the stone facade with 2-story bay and ornamentation still reads as a beautiful architectural composition. 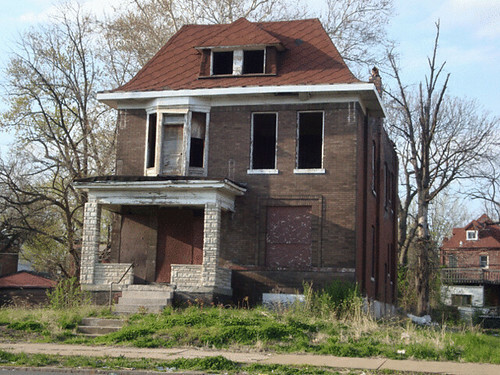 Built St. Louis featured this home on it's tour of Page Boulevard including a photo from 1998 prior to the loss of the porch roof. 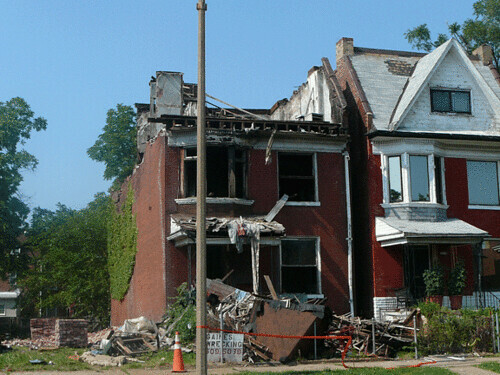 The home at 5069 Page was listed as an emergency demolition completed in May 2010. 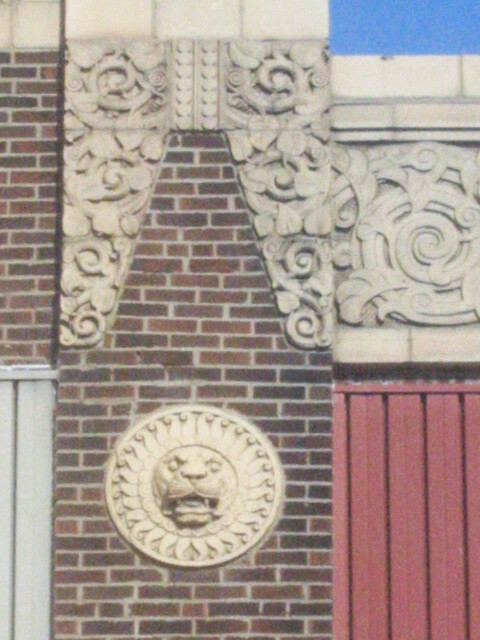 A view of the east side shows that the face brick had fallen off of a good portion of the side bay. The top chimney toward the rear of the home also appears to be bulging. While both serious conditions, I would not consider either of these an emergency. This Google Streetview is somewhat distorted and makes it appear the the entire building was leaning, which the frontal views show was not the case. 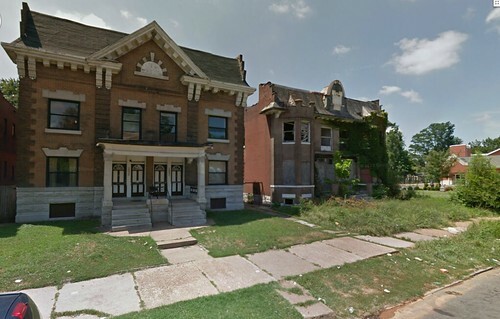 The other demolition at 5053 Page was also listed as an emergency demolition completed on the same date in 2010. It is unknown what condition prompted the demolition. 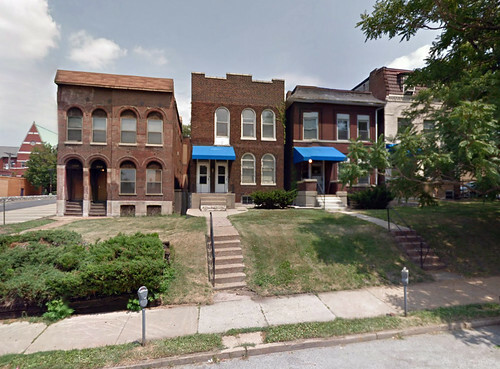 Additional images on Geo St. Louis show homes to the west and east of 5053. This one at 5061-63 Page was demolished in July 2008. This photo shows an all too common reason that this one was demolished. 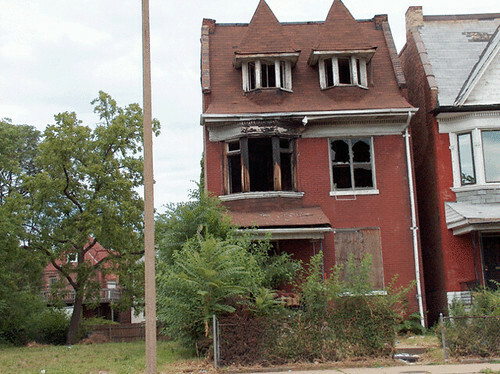 Three lots east of 5053, this house at 5047 was condemned in February 2004, likely due to fire damage visible in this 2006 photo. The house was demolished in July 2008. There are several things about the home next door at 5045 Page that would make some preservationists cringe, but the home is occupied and being maintained (new roof and siding at the gable since the previous photo), which is more than can be said for many buildings along Page Boulevard. 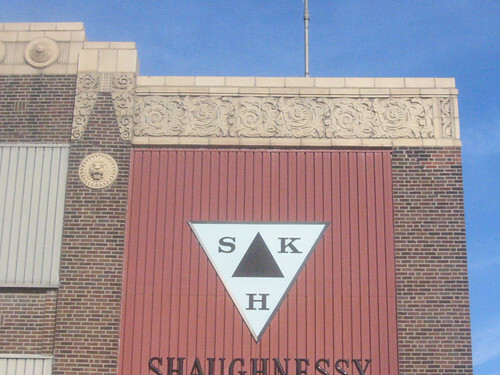 This Streetview before the 2010 demolitions shows what was a fairly intact block face along the north side of Page between Kingshighway and Academy. Google updated their imagery later this year, now showing the large vacant plot on the middle of the block. 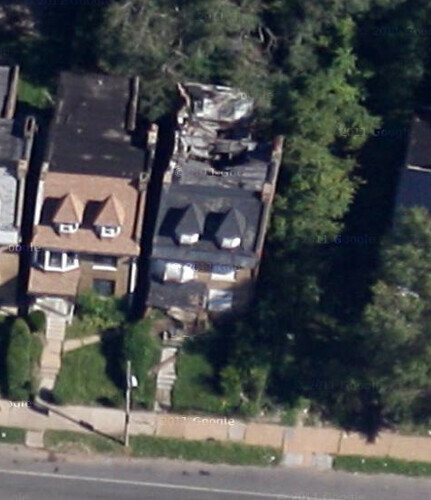 The boarded house in the middle of the Streetview above will probably also be lost soon, as the Google aerial shows extensive roof collapse. This view shows that you can now see through the back of the house. 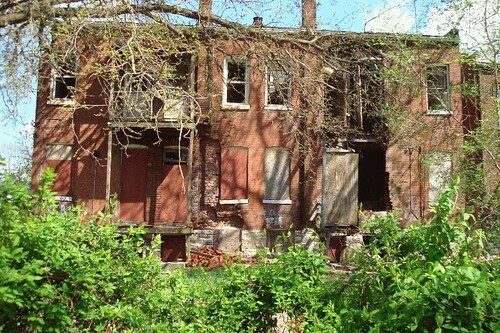 City records indicate that it was condemned in February 2010. Across the street a supportive housing facility was completed in 2006 on the site of several ornate 4-family buildings that had been previously demolished between 2000 and 2002. 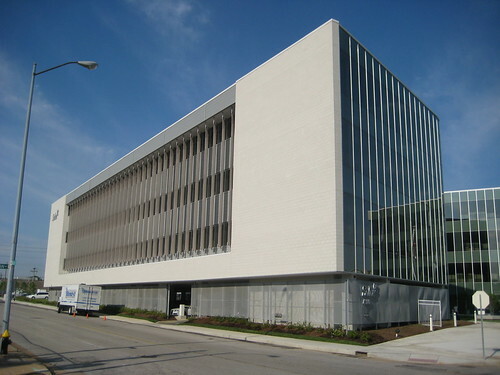 Once again, Built St. Louis is an invaluable resource as more photos from the Page Boulevard tour show one of the buildings demolished on this site and another just east of the new facility on a lot that is still vacant today. 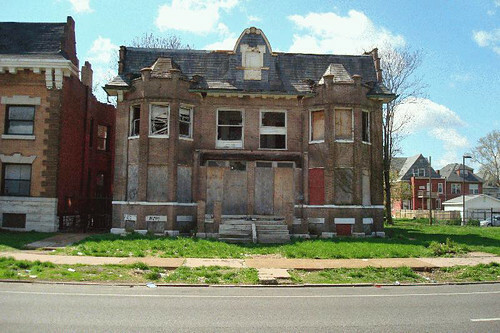 Unfortunately, not much has changed since those photos were taken ten years ago, and we continue to lose buildings along Page at an alarming rate. 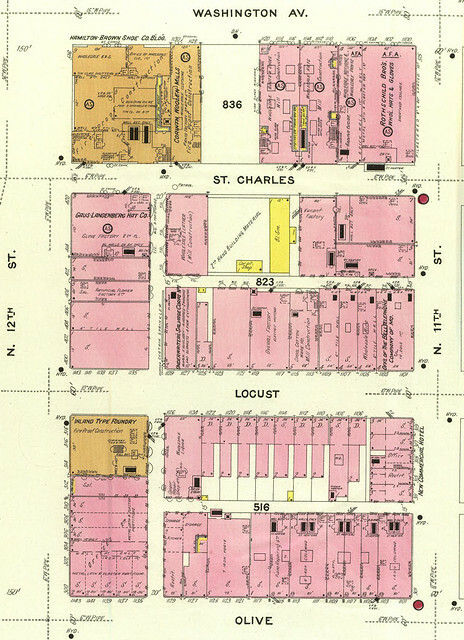 The two survivors in this row that according to a 1909 Sanborn map once numbered eight buildings are a stark contrast. 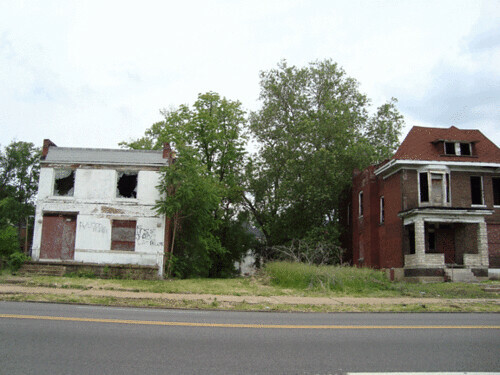 One is very well maintained and occupied, while the other since the Built St. Louis photo of 1998 has lost its porch roof and has deteriorated. 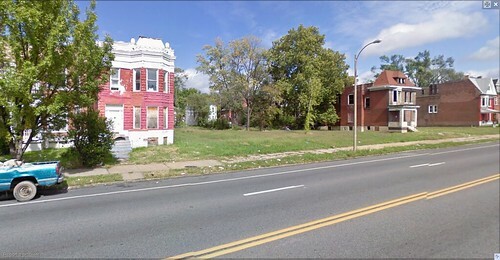 The abandoned building at 5038-40 Page is split into two parcels, both owned by the LRA and the east half was condemned by the City in July 2009. A rear view shows a minor collapse at the east half that is the probable cause of the condemnation as well as some loss of the outer wythe of brick at the west half. At this point this building is very much a savable structure, but something needs to be done soon to prevent further degradation. This is one of the many cases where several hundred dollars spent in temporary stabilization now could save thousands of our tax dollars in demolition cost a few years from now, not to mention slow the hemorrhaging loss of building stock. The historic Pond Hotel in Wildwood is in imminent danger of being demolished. The hotel is located at the intersection of Manchester and Pond Roads in the small community of Pond, which dates from the 1830's. Pond was never incorporated and became part of Wildwood when it incorporated in 1995. Photo above from The Past in Our Presence - Historic Buildings in St. Louis County. 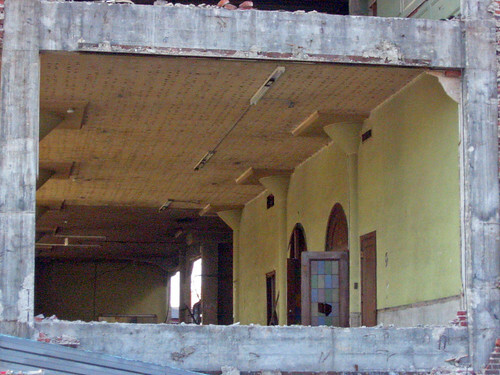 A recent photo accompanying a Suburban Journal article about the hotel shows the roof has collapsed at one of the rear wings of the building, causing the City of Wildwood to consider demanding either demolition or restoration of the building. The Pond Hotel has been owned by Scott Keller since 1995. 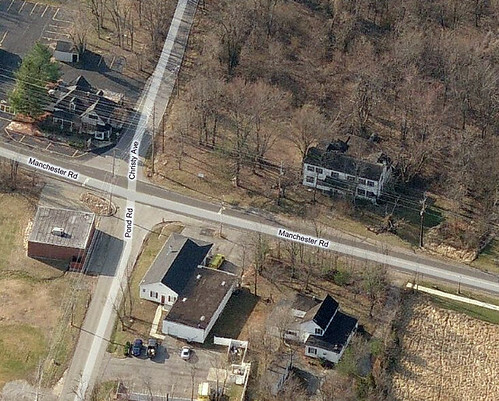 He had planned to renovate the hotel and open a microbrewery, but said that plans had stalled due to lack of adequate sewers in the area and lack of further development along Manchester Road west of the Wildwood Town Center, which is about 1.5 miles east of the hotel. 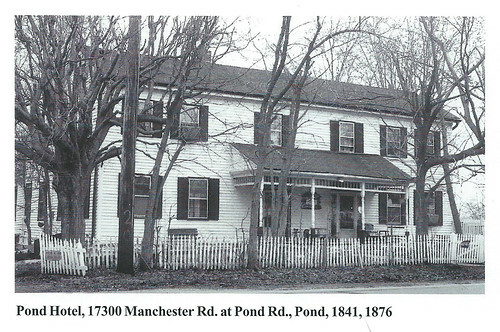 Another article in the Eureka - Wildwood Patch from 2011 mentioned that the Wildwood Historic Preservation Commission would discuss the Pond Hotel at a meeting on January 26, 2012. The first comment below the story mentions that the Preservation Commission decided at the meeting to have the Wildwood City Engineer inspect the building before a final decision is made about its fate. The more recent article in the Suburban Journal does not mention the inspection, but indicates the city had asked the owner to remove the structure, but did not give a deadline to do so. A quote from Joe Vujnich, Wildwood's director of planning and parks implies that with the recent roof collapse the city may soon press Keller to do something about the building. Reading between the lines, generally roof collapses occur due to deterioration from water infiltration. If the owner had made some basic roof repairs in 1995, the building would likely not be endangered today. 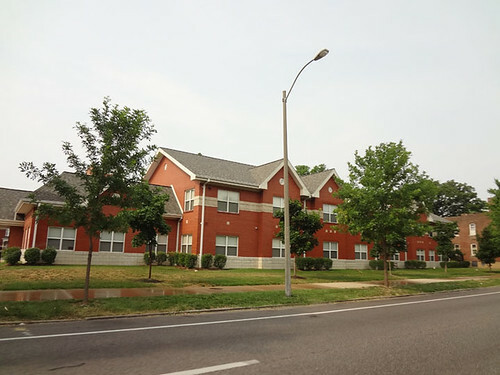 The University News of St. Louis University is reporting that SLU has announced that it will close the Laclede Houses, a group of 3 two-family apartment buildings at 3741 Laclede and that the buildings will be demolished. 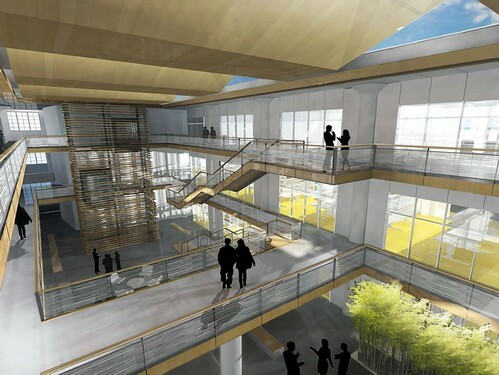 The story states that the buildings will be closed at the end of the spring semester in 2013. The three buildings owned by SLU were acquired in 1999. The fourth building at left in the photo above (sans blue awning) is not owned by SLU. 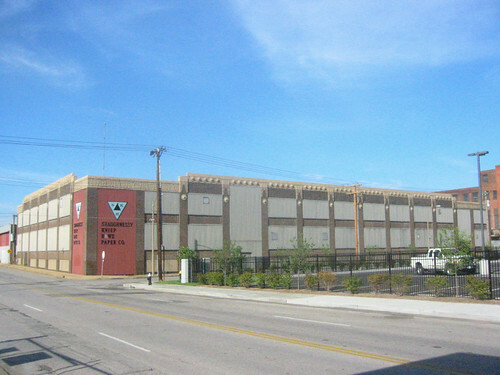 The buildings are located on Laclede between the newer University Village apartments to the west and the former Forest Pharmaceutical Building to the east. 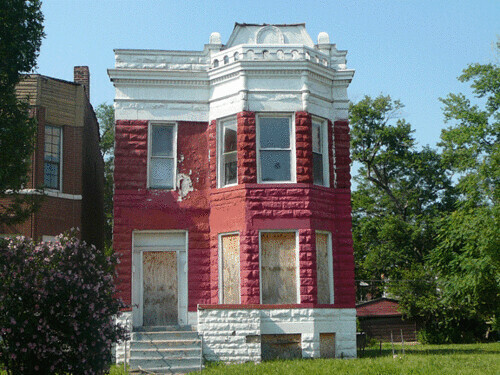 According to City of St. Louis property records, the buildings were built in 1892 and 1893. While the loss of these three buildings is somewhat less impactful due to loss of context and the fact that they don't stand out as highly significant from an architectural standpoint, the buildings are in livable sound condition. This statement can be said of almost any old building that is in need of rehabilitation of its basic systems due to age and use but clearly illustrates SLU's values. 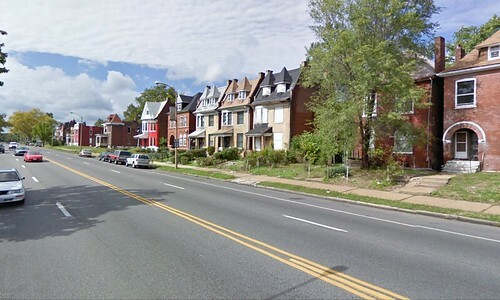 In stark contract to SLU's disregard, Washington University owns dozens of older apartment buildings in surrounding neighborhoods, mostly ranging from two to six-family buildings and several larger buildings. Many of these were acquired by Wash U in the late 90's when the owners of Parkview Properties decided to sell their portfolio. While the buildings had been maintained in very good shape over the years, like most buildings built in the early 20th century, their basic plumbing, mechanical and electrical systems needed attention. 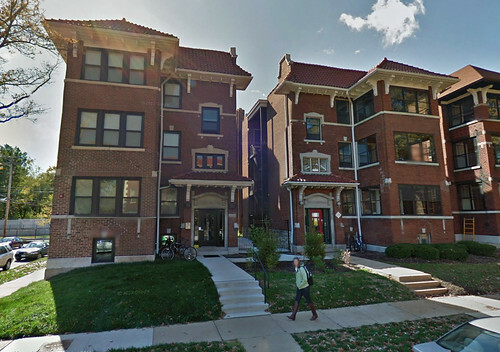 Last year, Washington University began implementing a program of complete renovation to these buildings, beginning with this pair at 6100 Pershing. 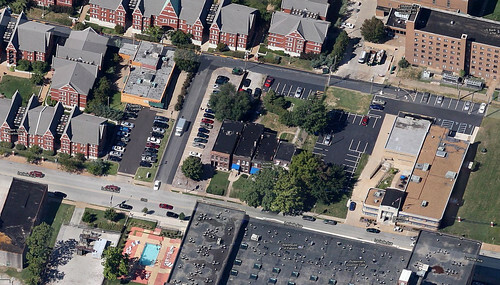 This year, Wash U is renovating an additional three buildings closer to Skinker in what will be a multi-year project. Unlike SLU, Washington University has been able to see that there is value that goes beyond simple numbers. St. Louis Development Corporation has released a Request for Proposals for Purchase and Redevelopment of the Cupples 7 Building located at 1014 Spruce Street. The deadline for submittal of proposals is January 10,2013. Montgomery Bank took back the building from Ballpark Lofts III, LLC after developers Kevin McGowan and Nat Walsh failed to pay back taxes of over $250,000 and the $1.4 million mortgage that was held by the bank. The bank is having SLDC / LCRA administer the process to see if there is interest in taking on the task of rehabilitation of the building. 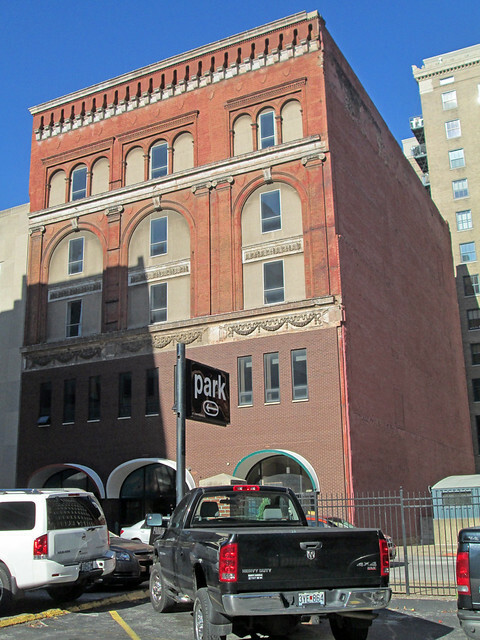 Last year the St. Louis Preservation Board denied a request by Ballpark Lofts III, LLC to demolish the building. My opinion, having dealt with a smaller, but very similar collapsing building in Lafayette Square that was rehabilitated into the M-Lofts by Craig Heller and Conrad Properties, is that Cupples 7 can be saved. It will take an experienced developer to put together the right package of financing combined with a creative use of the large footprint of the building to make the project work, but It can be done. A few months ago Craig Heller tipped me that Larry Deutsch had recently out-bid him to purchase the five-story building at 1107 Olive Street. 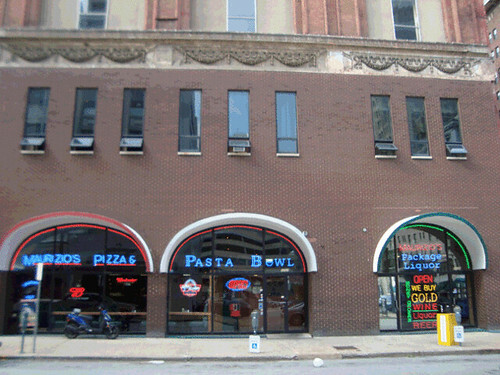 Most who work or live Downtown know it as the building as the Mauritzio's building for the greasy pizza & pasta lunch / late night buffet with an in-restaurant package liquor store (who doesn't love that combination!). 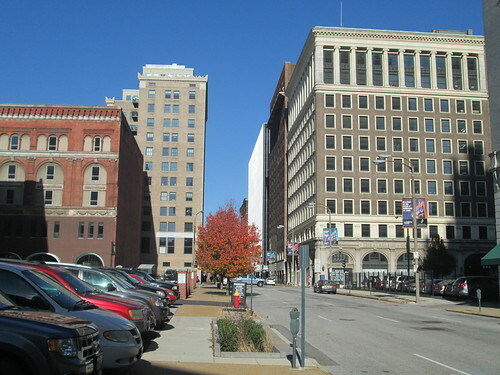 Craig mentioned that it was likely that Deutsch had intensions of demolishing the building for a private surface parking lot to serve the LGL Center, the former Laclede Gas Light building at the northeast corner of 11th & Olive that Deutsch has been slowly renovating over the last few years. Having not heard anything for a while, I was wondering if this ludicrous idea had been quashed, when a friend who lives in the nearby Louderman Lofts on 11th Street called me this week to say that the proposed demolition was on this months Preservation Board agenda. Anyone familiar with Downtown knows that Eleventh Street is a virtual wasteland of parking lots stretching uninterrupted on one side or the other (and sometimes both) from Pine Street six blocks north to Convention Plaza with the exception of the one half block south of Locust where the 12-story Louderman Lofts faces the 14-story former DeSoto Hotel across the street. To say that there are not a plethora of parking options for tenants of Deutsch's LGL Center in almost all directions would be crazy. 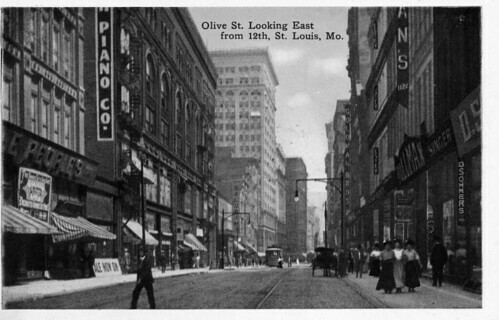 While some of the surface lots, such as those directly across Olive are private, there are several general use lots within a block on Locust and on Pine. 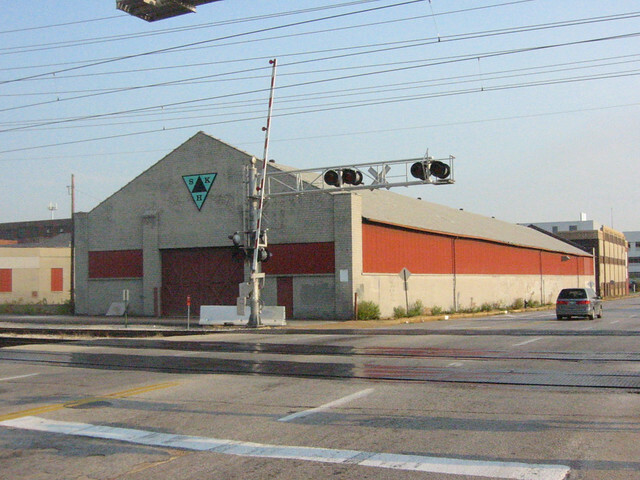 Then there is the garage on Locust less than 300 feet west of 11th Street (where many co-workers in the Ludwig Lofts building park) as well as the underutilized giant 9th Street Garage about 350 feet east of the LGL Center. 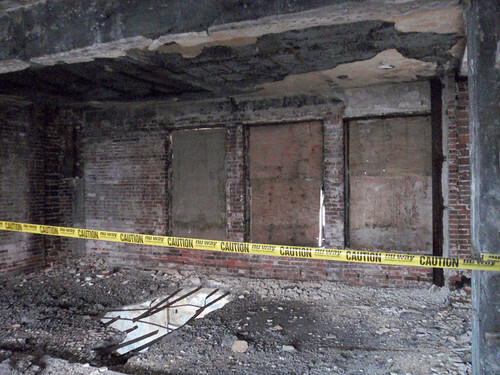 Deutsch will no doubt try to convince the Preservation Board that the former Maurizio's building was damaged beyond repair when an underground garage was installed just east of the building in 2003. Thats funny since Mauizio's restaurant continued to occupy the first floor until earlier this year, and there has been no condemnation of the building. In May of this year, a jury did agree that HBD Contracting is responsible for settling that caused a crack the full height of the building and awarded the former owner $1.3 million to cover the damage. At the time of the verdict, the owner told his layer he was happy with the verdict, which was over the $1 million that he had estimated it would take to repair the building. He also said he would like to do something with the upper floors if it weren't for tough residential condo market. 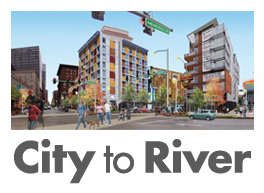 See this RFT blog post for the full story. 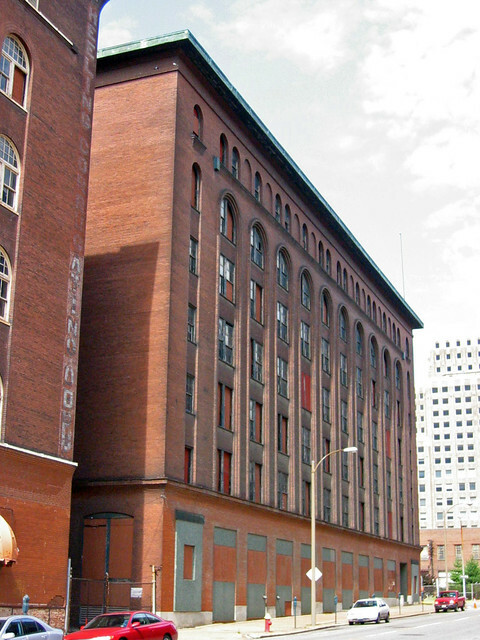 Deutsch has been an owner of many buildings Downtown for decades with a mixed track record of care and respect for them Some may recall that when he owned the Merchandise Mart on Washington, he once proposed to demolish most of the building for parking. He also apparently did demolish the rear portion of the former Lindell Real Estate Company building at 1015 Washington himself! In the remaining portion and the adjoining Dorsa Building he built a haphazard array of apartments that Pyramid Companies later altered converted to condos with a full rehabilitation of the buildings. If Craig Heller had purchased the building, there is no doubt that he would rehabilitate it with a mix of ground floor retail and office and/or apartments above, a combination with which he has had success with in several buildings in the immediate area. 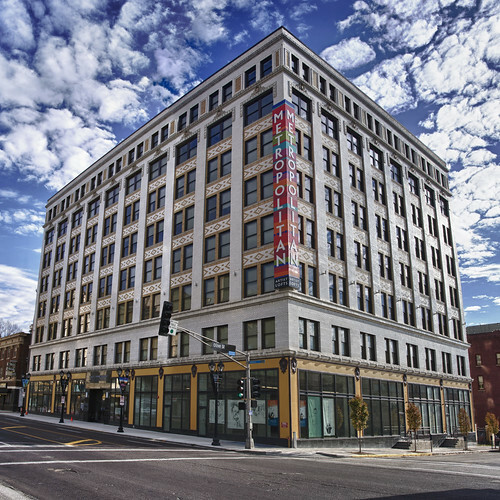 When he renovated the Louderman Building, Heller had the underground garage at the northeast corner of 11th and Olive structured to carry new construction when the market was right for it. Owning the Maurizio's building would allow Craig to build on the corner, connect the floors to the existing building and share the cost of an elevator and stairs between the two. Interestingly, the former Maurizio's building extended to the corner of 11th & Olive when it was built in 1881. This Sanborn map shows the configuration of the building, which may have been built in stages. This postcard image from the Mercantile Library collection shows the building in its original state with two additional bays at the running to the corner and three additional bays to the west of the remaining building. As I recall, the portion at the corner had been clad in shiny aluminum siding at some point and according to City property records, was demolished after an emergency condemnation in 1998. 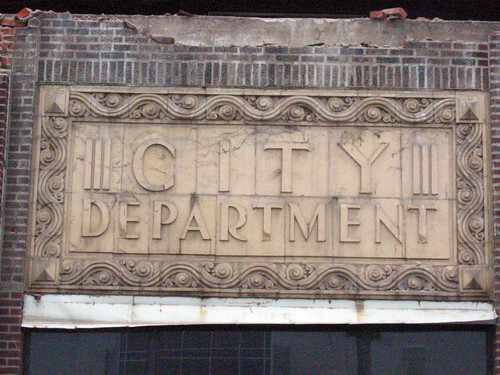 The three western bays of the building would have been demolished to make way for the International Style Post-Dispatch Printing Plant that opened at 1111 Olive in 1941. Although the building at 1107 Olive has been attacked from both ends and its storefront closed in with non-matching brick, the building still retains a substantial amount of character. The two story expanse of what appears in the postcard to be mostly glass storefront was a significant achievement for that time period. 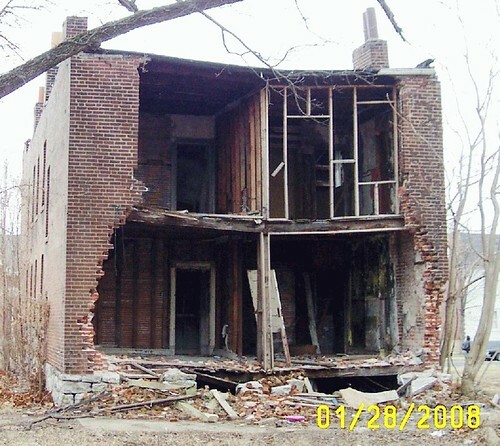 As readers know, typically my posts focus on the destruction of historic architecture in St. Louis. This post however focuses on a building that I have had the pleasure of working on... twice, and has survived against the odds, having been rehabilitated and restored for the future. Tonight is the official grand re-opening, although the building has been occupied since early September. The Metropolitan Building, designed by the architectural firm of Mauran, Russell & Garden and atypically clad in white glazed brick with gold accents was built in 1907 as an office building for doctors. In 1977, when Landmarks Association nominated the Midtown Historic District to the National Register, the eight story Metropolitan was vacant except for a handful of first floor retail spaces. 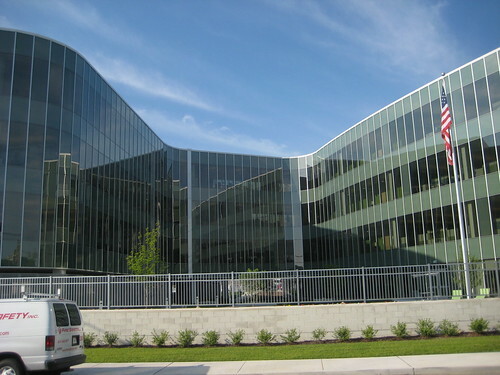 In late 2005, when I first entered the building as the architect with the Pyramid Companies, 28 years of vacancy and a complete lack of maintenance had taken its toll on the building. The structure of the building was an unusual mix of cast iron columns, steel beams and cinder concrete floor slabs reinforced not with typical round bars, but 1/8" thick steel straps. The problem with cinder concrete is that when it gets wet, it creates sulfuric acid, which does bad things to steel straps. The north wing of the building was in the worst condition, with one structural bay at the east end collapsed down to the 4th floor and gaping holes down two more floors. 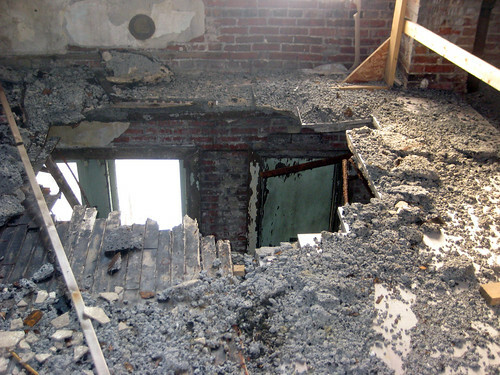 A similar condition existed near the central elevator core with a gaping hole trough the slabs down to the third floor. Many other slabs at the roof and upper floors of the north wing were crumbling and nearing collapse. While the Metropolitan Building was never technically threatened with imminent demolition, the building's condition sent many would-be developers running scared. While giant slabs of asphalt and vacant lots continue to thrive, Grand Center had been no stranger to large scale demolitions over the years. 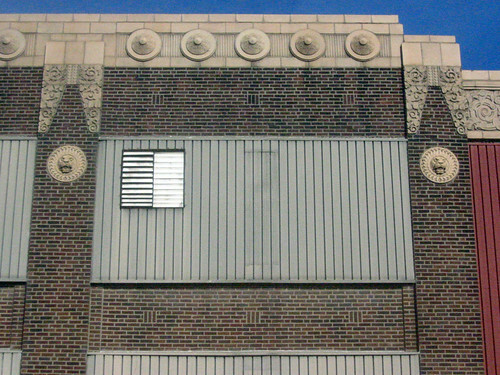 In 1997, just one year before the enacting of the Missouri Historic Rehabilitation Tax Credit, the 10-story Beaumont Medical Building on Washington Blvd., which had none of the structural problems of the Metropolitan, was imploded to make way for construction of the Pultizer Foundation for the Arts, which was originally going to be built on the site where Channel 9 eventually built. Just prior to the Beaumont's demise, the 5-story Raleigh Apartments was demolished for a parking lot for the Sheldon. Pyramid Companies, however had confidence that the Metropolitan could be restored, but it would take significant measures not required in typical historic rehabilitations. 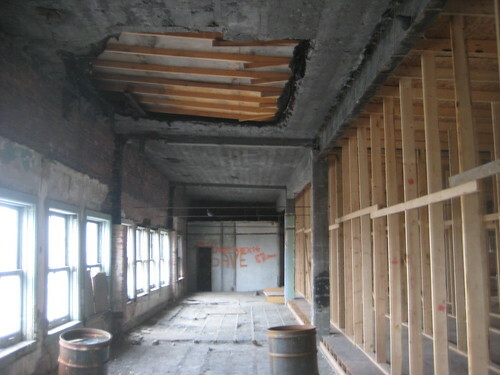 Because of the condition of the structure on the upper floors and the uncertainty of the condition of the thin reinforcement straps in other areas of the building, the structural engineer determined that all areas of the floor would need to receive supplemental structural support. 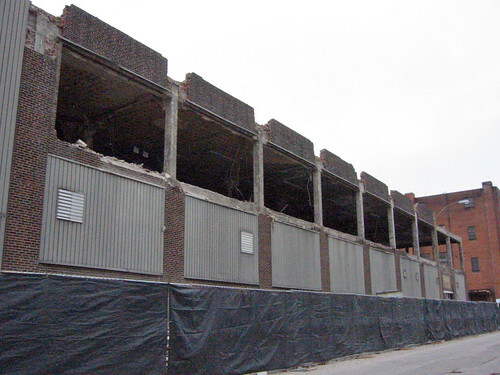 In late 2006-early 2007, Pyramid Companies hired Environmental Operations, Inc. to complete selective interior demolition throughout the building. Most partitions outside of the corridors were removed at that time, but before finishing, a fire caused by sparks damaged a portion of the second floor. 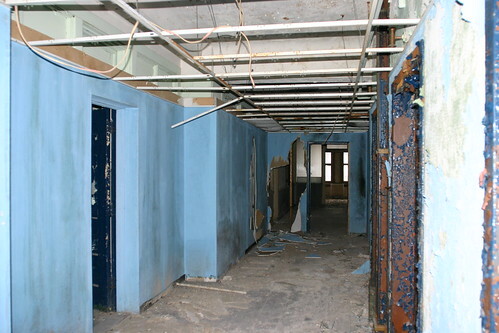 A view of another corridor that had been "modernized" prior to the selective interior demolition. 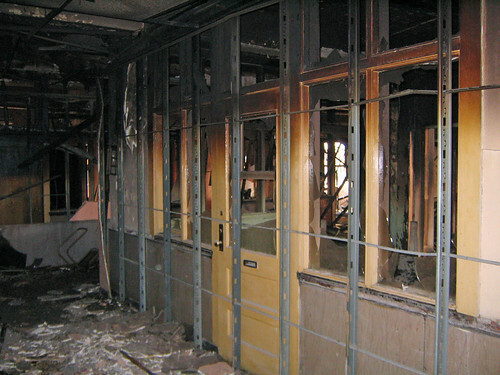 Following Pyramid's closure in 2008, the bank that took possession of the building had temporary shoring installed in areas of the 7th & 8th floors where the structure had been weakened by years of deterioration. 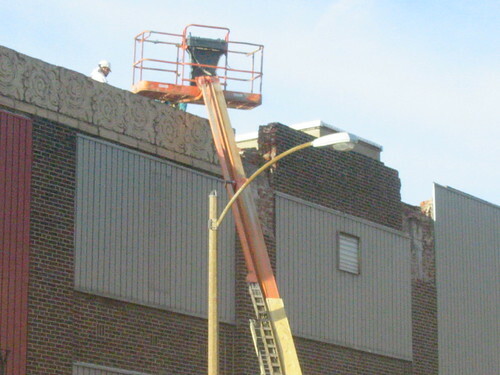 The roof was also patched and the building was mothballed. 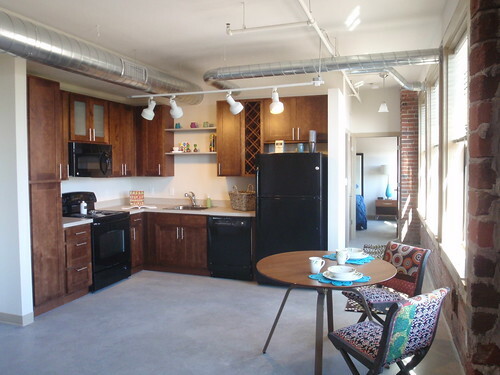 In 2010, Dominium Development of Minneapolis became interested in the Metropolitan and was confident they could complete a rehabilitation of the building for affordable artist loft apartments. 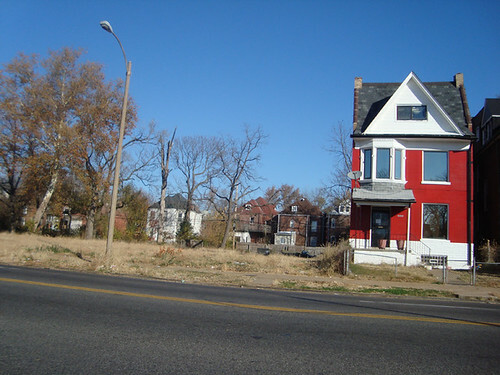 They were awarded Low Income Housing Tax Credits by the Missouri Housing Development Commission. 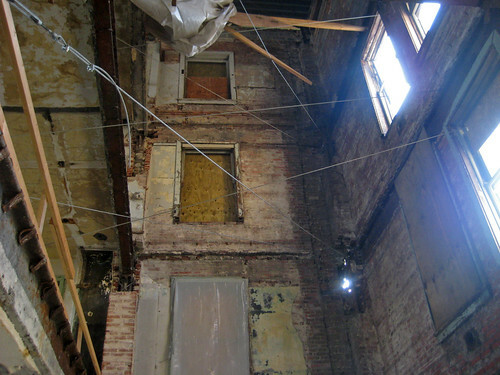 In mid-2011, construction began, which included re-building collapsed and deteriorated sections of floor and roof. 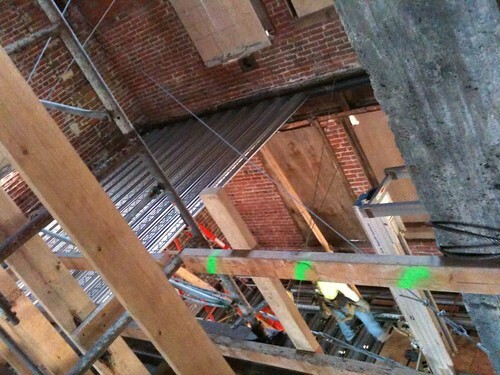 The same structural metal deck seen above was also hung from the beams under all other remaining sections of floor as reinforcement due to the unknown condition of the steel straps that had been exposed to 30 years of weather. 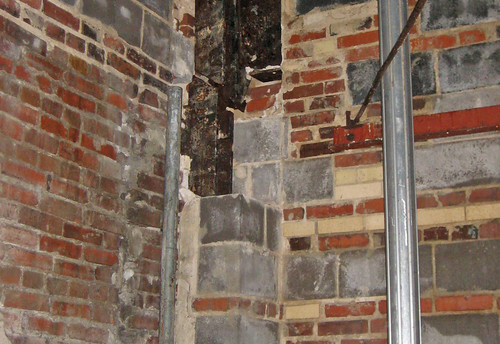 During construction several instances of cracked cast iron columns were found which required additional structural repair. 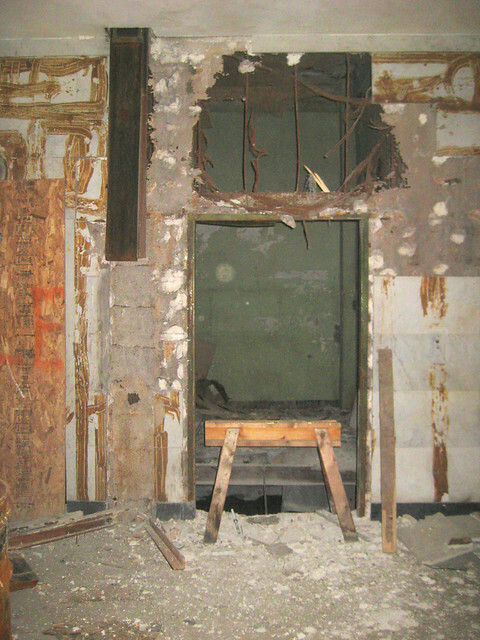 The condition of the first floor elevator lobby prior to re-construction. Restoration of the Metropolitan was completed in late August of this year, with new residents moving in shortly thereafter. 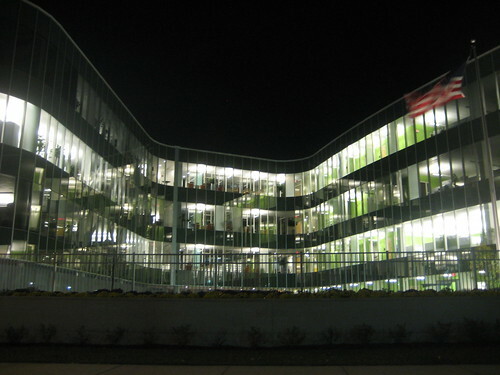 The building was mostly pre-leased, and quickly reached 100% occupancy. 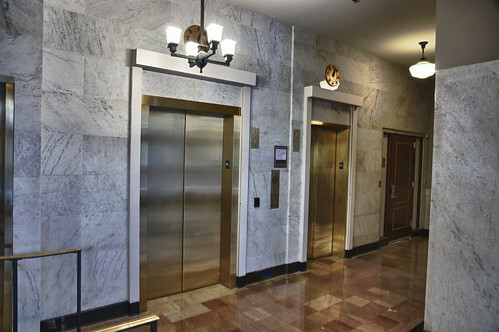 The restored fist floor elevator lobby is pictured above. 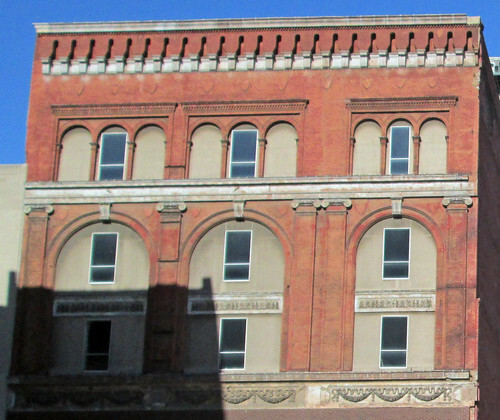 With the use of Missouri and Federal Historic Rehabilitation Tax Credits, surviving historic features of the building were either restored or replicated. 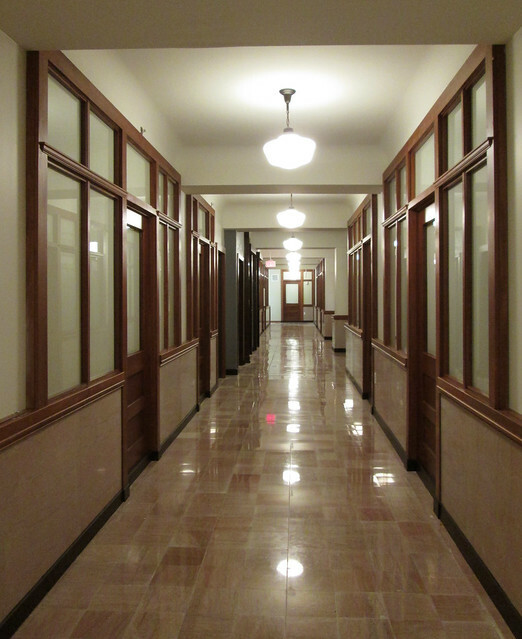 Corridors were returned nearly to their original appearance on floors 2-4. Typical loft apartments feature new polished concrete floors, either brick or original plaster exterior walls (depending upon what existed) restored window trim and new finishes throughout the remainder of the residence. 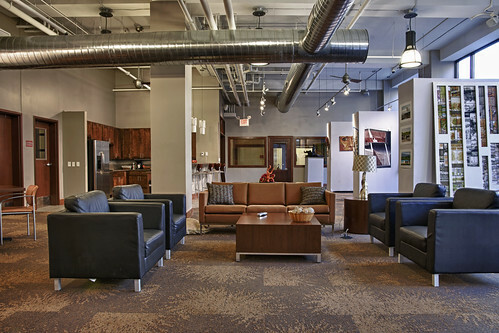 A spacious first floor community room is available for residents and includes a gallery area along the Grand Boulevard storefront windows for the artists to display their work. There are also common art studios on the first floor and basement, a dance studio, fitness room and four music studios for use by the resident artists. A retail space at the corner of Grand & Olive will hopefully have a new computer store specializing in Macs opening in the spring of next year.